Overall, Gold’s Gym Stride Trainer 350i can be considered nothing more than a basic, entry level elliptical that is only suitable for lightweight people. Gold’s Gym Stride Trainer 350i is a rear drive elliptical trainer that comes with an average range of features for a very low price. To aid you in reaching your weight loss targets at home, it comes equipped with twelve resistance levels and eight preset workouts. Also, the magnetic resistance helps your workout sessions stay silent from start to end. The newest add-on to this model is the iFit compatibility with your IOS or Android tablets that give you easy access to custom training programs and better health statistics tracking. The market price of $277 makes it a decent buy for newcomers into the fitness world – although we would suggest you look at some other brands before you make a quick purchase decision. Sturdy construction at a low price. Twelve resistance levels and eight built-in workouts. Rollers on the bottom make moving it around an easy job. iFit Module to make workouts more engaging. Smooth pedal with low impact on joints. It is compact – good for smaller homes. Ergonomic grip design with moving handlebars. Stationary handles with pulse monitors. Only has a 90-days warranty on parts and labor. No workout fans or audio speakers. A short stride of 14″ causes inconvenience for users over 6 feet. Some units are known to be squeaky and not as silent as promised. 12 digital resistance levels Tablet/Smartphone and bottle holder. 14″ Stride length. Silent magnetic resistance system. Heart rate monitors on stationary handles. Transport wheels for the moving convenience. Concerning performance, this machine is nothing extraordinary and reflects the price paid. Customers are often known to complain about it not delivering as promised. One of the most reported issues was a squeaking sound produced due to the friction between the legs and metal frames during workings, which completely makes the SMR system redundant. Moreover, problems with iFit connectivity are also quite common among buyers. Apart from these problems, the machine does deliver on a smooth pedaling experience, ergonomic handlebars and a design that is quite comfortable to workout on for average height users. Compared to other trainers in the market, the build quality can be slightly disappointing. But then again, for something below the $300 mark, not too much can be expected. Buyers sometimes say it looks cheap and is too wobbly when supporting above 200 lbs. Users also continue to complain about squeaks that only seem to get louder from the very first usage. Considering all these, backed by only a 90-days warranty, it might be a machine to be skipped if you have the budget to go a bit higher. It is worth mentioning that there are a small number of unfortunate buyers who experienced breakdowns pretty early in their usage (within six months). You might have to maintain the product on some regularity to keep it in a tip-top condition and avoid such misfortune. According to a lot of users, the construction of this particular model is overly complicated. Customers faced difficulties even when guided by its manual – some even quitting after a certain point. Some blame missing parts, while others just think it is way too complex. Unless you are experienced in putting machines like this together, getting some help might be a good idea. 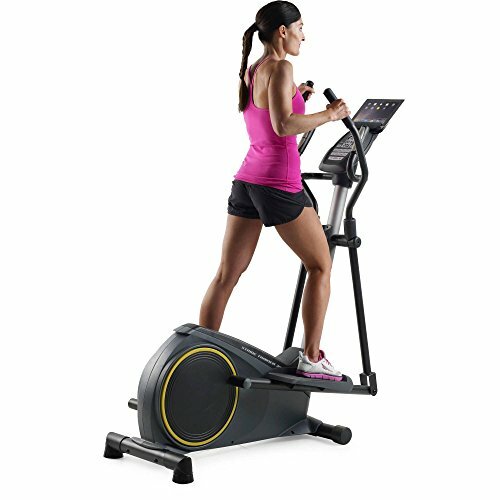 Overall, Gold’s Gym Stride Trainer 350i can be considered nothing more than a basic, entry level elliptical that is only suitable for lightweight people. But considering all the negativity surrounding this model, even beginners are recommended to look around a bit more. Nonetheless, for those on a tight budget – it will do the job fine. Just be sure to be jamming out on your favorite workout tracks to cover the occasional squeaking during a heavy workout! Terrible customer service and quality for this machine. The screws that hold the machine together are cheep material and the hex screw heads ream out before it can be tightened enough to keep it from squeaking. I called the customer service number presented and was left on hold for a total of over an hour with no answer so I called back and left a number for them to call- and no call back and still waiting the next day. I am having to purchase new bolts from Fastenal to get the machine operable. VERY dissatisfied Customer!!! Hi Alex, I am really sorry to hear your bad experience with Gold’s Gym. They used to offer better customer service. We have also heard similar complaints from a few of our readers. As a result, we are going to remove all Gold’s Gym elliptical’s from our “Top 10” list. Terrible machine and even worse customer service. Don’t walk away from this machine, run away as fast as you can and get the exercise that you would not have gotten on this squeaky excuse for an exerciser. My husband and I purchased the Stride Trainer 350i — followed the instructions precisely, and greasing all places the manual said to grease. After using it one time the noise it makes is terrible. Even went to a service station and asked for some of their auto grease and used that on all places requiring grease. Didn’t help at all. Haven’t tried the leveling mechanism yet, so will try that next. Disappointing.